What Are Watercolor Tattoos and How To Care for your new tattoo. Watercolor tattoos are a growing trend in the tattoo industry, and they are an increasingly popular choice for both male and female patrons of tattoo parlors. Based on their appearance, these tattoos are commonly misperceived as a separate kind of tattoo altogether, one that necessitates an entirely different method of application. However, these tattoos are created using the same needling process as traditional tattoo artwork. The only major artistic difference is found in the shading and coloring techniques used during application. These techniques, in effect, produce colorful eye-catching results that resemble intricate watercolor paintings. The bright colors and sharp contrasts of this unique tattoo style can be a bold choice for creating visual interest and drawing attention to the specific image that the tattoo portrays. Are These Tattoos Prone to Fading? Because of their intricate use of color and shading, many people believe that tattoos using the watercolor technique will not be as long-lasting as a more traditional tattoo. Truthfully, colored tattoos are more prone to fading over time; however, the degree to which colors fade really depends on the skill level of the tattoo artist who creates and implements the tattoo. A skilled tattoo artist will design and apply a tattoo that uses a solid black base in addition to creating a watercolor gradient, promoting long-lasting color. Upon receiving the tattoo, the artist should also inform the patron of caretaking strategies to maintain the tattoo and prevent fading. After many years of application, tattoo touch ups for any style of tattoo, watercolor or otherwise, can be requested as well. Touch ups will restore faded lines and colors, thus adding a new breath of life to your investment. Do keep in mind that you should rely on a tattoo artist equally as skilled as your original artist to touch up the lines and colors of your tattoo. How Do I Care for My Watercolor Tattoos? Just like with traditional tattoos, tattoos using watercolor gradients require special care. Even before you get your tattoo, be sure to select an artist that is reputable and has a portfolio of tattoos of this style. You want to trust that your artist has the skills to give you a long-lasting tattoo that will not fade over time. Once the tattoo has been applied, make sure to keep it wrapped and moisturized to allow for it to heal. This will prevent any skin from drying out, flaking, or peeling, which can compromise the color quality from the day the tattoo is applied. After the tattoo has healed, it is important to use proper sun protection. Always apply an SPF in order to prevent any UV damage to your skin and to the tattoo ink. Also, avoid rubbing the tattoo. Ideally, you should have the tattoo placed on an area that is not prone to chafing or scratching. Continue to moisturize your skin even after the tattoo has healed to encourage the preservation of color. Of course, additional strategies for good skin care, including staying hydrated, eating a nutritious diet, taking a multivitamin, and receiving plenty of sleep, will help maintain the tattoo’s vibrant coloring over time. What Should I Keep in Mind When Selecting This Tattoo Style? Tattoos using the watercolor technique can be quite eye-catching, taking inspiration from traditional canvas art and placing it on the body. 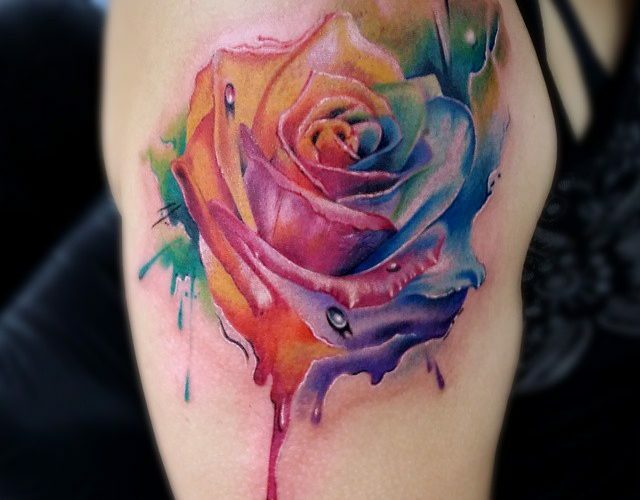 Both men and women have found this tattoo style appealing for its vibrant use of color gradients for a unique aesthetic effect. These tattoos use the same techniques as traditional, solid-filled tattoo artwork, the only main difference is that they require a bit more maintenance to preserve color upon getting the tattoo and over time. Be sure to consider your own personal willingness to use SPF, moisturize, and maintain a healthy routine to keep this style of tattoo in tact. Should you select this particular style, there’s no doubt that it will receive special attention from onlookers for its dramatic implementation of color and shading techniques. For great ideas take a look at our photo gallery.